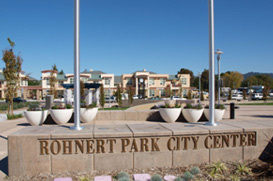 Rohnert Park is a dynamic community, home to Sonoma State University, many parks, walking and biking trails, as well as the Community Center which houses Spreckles Performing Arts and the Callinan Sports and Fitness Center. Soon to be completed at Sonoma State University is the world class Green Music Center, which will be home the Santa Rosa Symphony. Located centrally in Sonoma County, Rohnert Park is a 45-minute drive to San Francisco and just minutes from Petaluma and Santa Rosa. Also nearby is an abundance of Sonoma County wineries, vineyards, Bodega Bay, the redwoods, restaurants and plenty of shopping. For the avid golfer, Foxtail Golf Club features two courses and a driving range on the south course. Children and the young at heart enjoy the Scandia Family Fun Center, which houses a mini golf course, bumper boats, go carts, and a batting cage. One of the few recognized “green” business centers in the country, Sonoma Mountain Village has opportunities for start up businesses. Rohnert Park has lovely views of the nearby mountains and is a community for all ages.